Nevada features a variety of habitats for its native snake species. These range from arid deserts to aquatic environments such as Lake Tahoe and the Colorado River. Some of Nevada's snakes are constrictors, which means they squeeze their prey to suffocate them, and five species of snakes in Nevada rely on venom to subdue their prey. Even non-venomous snakes may bite humans to defend themselves. All of Nevada's venomous snakes are rattlesnakes. 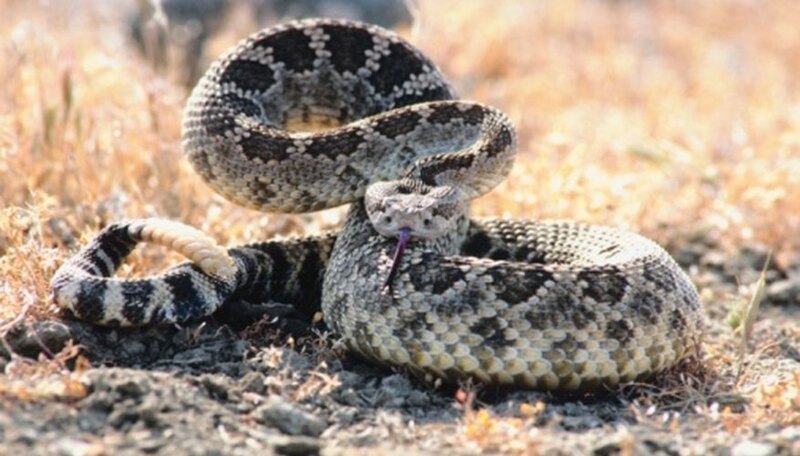 The Silver State's venomous snake species are the sidewinder, Western diamondback rattlesnake, Great Basin rattlesnake, speckled rattlesnake and Mojave green rattlesnake. When alarmed or threatened, these snakes shake the rattles on the ends of their bodies rattles to ward off potential predators. Young snakes with undeveloped rattles don't always make the rattling sound, but they are just as dangerous as adults. The snakes deliver venom through their fangs the purpose of which is to paralyze prey so the snakes don't have to struggle with it. Nevada has four garter snake species belonging to the genus Thamnophis: common, Mexican, Sierra garden and Western terrestrial garter snakes. The garter is among the most common snake in the United States. These snakes may be identified by the stripes which run along the length of their bodies. Two of Nevada's garter snakes – the Sierra garden and Mexican – live near aquatic habitats such as Lake Tahoe or the Colorado River. Common garter snakes prefer the grasslands of northwest Nevada, while members of the Western terrestrial species live in the desert and semi-aquatic habitats. Garter snakes emit a fluid with a musky odor as a defense mechanism. Whipsnakes are a species of Colubrid snakes with sharp, whip-like tails and the ability to move quickly. Nevada's two whipsnake species are the coachwhip and striped whipsnake. The striped whipsnake is among the largest snakes in Nevada, growing up to 6 feet long; coachwhips, on the other hand, are approximately 5 feet long. Both live in dry, arid environments, including the state's deserts and the woodlands near Lake Tahoe. Although their tails have the appearance of whips, whipsnakes are not known to use them that way. The only two kingsnakes found in Nevada are the California kingsnake and Sonoran mountain kingsnake. These reptiles, which are constrictors, are known as “kingsnakes” because they eat other snakes, including venomous varieties. In Nevada, the California kingsnake inhabits the scrublands and rocky cliffs in the southern region of the state; the Sonoran mountain kingsnake, also known as the Arizona mountain kingsnake, lives at higher elevations, on mountains in east and central Nevada. 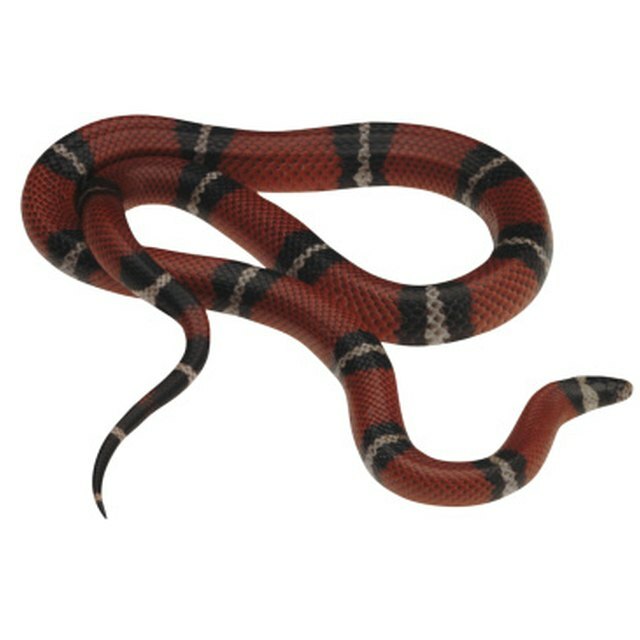 California kingsnakes haved black and white rings on their skin, while Sonorans have red, white and black ring patterns. Davis, Skip. "Snakes in Nevada." Sciencing, https://sciencing.com/snakes-nevada-8516931.html. 25 April 2017.